The Big Short (starring Christian Bale, Steve Carell, Ryan Gosling, and Brad Pitt) tells the true story of a small group of investors who foresaw the 2008 crash and played it to their advantage by betting against the market. Their investments led them into the underbelly of financial America, and their lives were forever changed by the the corruption and the greed that they witnessed. This latest addition to Hollywood’s growing list of Wall Street movies simultaneously shows the allure and the fleetingness of wealth. An important part of the plot takes place in Las Vegas where the main protagonists go to attend a conference in order to learn more about securities based on subprime mortgages. The entire city of Las Vegas, with its flashiness and get-rich-quick glamour, provides an apt backdrop as the main characters gradually become more aware that the housing market financial sector has become a virtual casino with traders betting recklessly on subprime loans. The evanescent nature of these traders’ wealth and success is highlighted by the gambling that surrounds them. I watched the movie in Manhattan, blocks away from where some of the scenes were filmed. First-time visitors are often awed by wealth and power that fill the city, and and it is certainly easy to feel dwarfed in many ways by its massive canyon of skyscrapers, each of which is an impressive monument of financial success. Engulfed by such embodiments of capital, its easy to forget that all it takes is the burst of a financial bubble or some other calamity and the buildings will becoming nothing more than hollow shells. Coincidentally, the same day I watched The Big Short, I visited the Metropolitan Museum of Art and spent some time looking at vanitas paintings. This genre of Dutch still lifes shows beautiful objects in exquisite detail interspersed with disconcerting hints of their fleetingness. 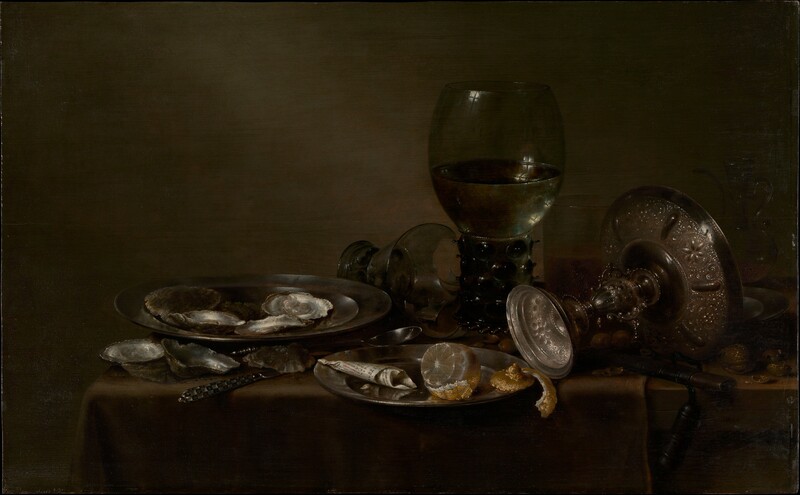 For example, this painting by Willem Claesz Heda shows expensive tableware and the leftovers of a rich meal, but disorder clashes with opulence: the silver tazza is tipped over, a glass is broken in the background, and items balance precariously on the edge of the table. The tasty oysters are almost all gone. A half-peeled lemon provides a metaphor of the luxurious life: it may be beautiful to look at, but it is bitter to taste. Overall, the painting effectively evokes a “party’s-over” feeling of dissatisfaction and regret: things are broken, food is gone, and a mess has to be picked up. Watching The Big Short, I got the same feeling, especially towards the end of the film when the market crashes and images of despair increase, one of them being the mass exodus of Lehman Brothers employees after the bank’s bankruptcy. Disillusioned and disgruntled, they haul their belongings out of the building while being told by a shouting supervisor not to talk to any of the press. Two of the main characters take someone’s security card and go against the flow into the Lehman Brothers trading floor where they find post-apocalyptic desolation – empty desks and cluttered floors. In one powerful moment, they experienced the vanity of wealth: the mighty institution they had once dreamed of being a part of had been reduced to financial rubble. “This isn’t how I pictured it,” one of them says. Like the Dutch still-life artists, Hollywood creates art that makes money by riding waves of popular sentiment. The 16th-century artists of Holland were appealing to sober-minded Calvinists and 21st-century producers of Hollywood are capitalizing on collective post-recession cynicism. Nevertheless, the truth portrayed in the their art is still universally valid and coincides with Scripture: wealth is fleeting. St. Paul reminds us that “we brought nothing into the world, just as we shall not be able to take anything out of it” (1 Tim 6:7), and Jesus said “Do not store up for yourselves treasures on earth, where moth and rust destroy, and where thieves break in and steal” (Matt 6:19). None of this is to say that wealth is bad in itself. Material possessions are good and necessary, but we must value them appropriately. We can and should enjoy the wealth that God blesses us with, but we should do so remembering its fleetingness and keeping our eyes are Heaven “where neither moth nor rust destroys, and where thieves do not break in or steal” (Mt 6:20). The Big Short ends with alternating images: mansions and tent cities, jet skis and eviction notices, celebrating yuppies and homeless families. This juxtaposition is vanitas-like insofar as it reminds how quickly one’s fortune can change. The background music of Led Zeppelin’s When the Levee Breaks drives the point home. Thankfully, we know that as long as we build our lives on the solid ground of Our Lord’s teachings, we will be more than ready for whenever the next levee breaks: “And the rain fell, and the floods came, and the winds blew and slammed against that house; and yet it did not fall, for it had been founded on the rock” (Matthew 7:25).